Mary, Jensen, and Jackie (from left to right) traveled to St. Charles, Missouri for the annual CCSA convention. 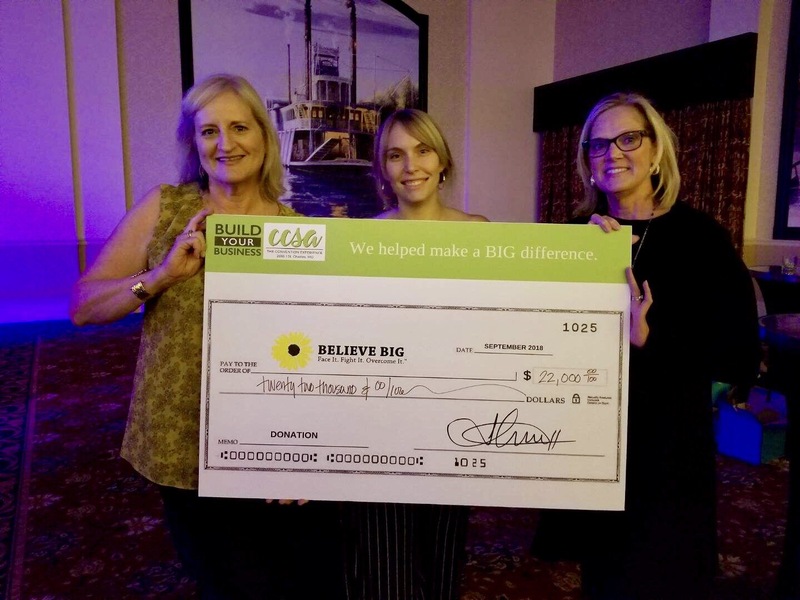 For the second year in a row, Believe Big was chosen as their charity of choice. The convention connected us with at least 30 new pottery studio partners nationwide that will now be offering Believe Mugs. Through their silent auction and raffles, the CCSA was able to raise $22,000 for Believe Big! Thanks to the CCSA, we are able to make a huge impact in the lives of those battling cancer. We are thankful and grateful for this partnership! Additionally, one of our studio partners in Fort Wayne, Indiana, Bisque It, was featured on their local news station delivering mugs to a nearby oncology center. Bisque It is holding an October event commemorating their 1st anniversary of participation in the Believe Mug program and will donate half of their event proceeds to Believe Big! Check out the great story below!